Emirates Airways CEO Tim Clark says he expects to hear more on the planned Airbus A380neo around the middle of this year, and the influential airline chief is likely to have his pen poised to sign a massive order when the time is right. Speaking at Dubai's Arabian Travel Market overnight, Clark admitted "we have not yet heard anything from them [Airbus] on it. And we have not given them any deadline for it,” Clark said. “So we are just waiting." Asked when he expected an update on this next-gen superjumbo, Clark replied: "Maybe June, July." Clark has been the industry's strongest lobbyist for the A380neo, which would use high-efficiency engines (in Airbus parlance, 'neo' stands for 'new engine option') and refined aerodynamics to let the doubledecker jet fly more miles while burning less fuel. Emirates is Airbus' largest A380 customer, with 60 superjumbos already flying and another 80 on order. “(The A380) is our flagship and there is a distinct possibility that the neo, if built, will give us an improvement in economics of up to 10 to 12 per cent so that is definitely worth having" Clark has previously said, adding that Reuters that Emirates would eventually replace all 140 of its A380s with an A380neo. PREVIOUS | Airbus CEO Fabrice Bregier has confirmed plans for an A380neo with more fuel-efficient engines as well as a longer version of the superjumbo – dubbed the A380-900 – capable of carrying even more passengers than today's double-decker jet. Speaking on the second day of Airbus' annual investor event, Bregier announced "We will one day launch an A380neo and one day launch a stretched A380." His comments follow speculation that Airbus could axe the A380 ahead of its time due to softening demand, with no new airlines signing up for the superjumbo this year, while next-generation twin-engine jets such as the A350 and Boeing 777X continue to win orders. 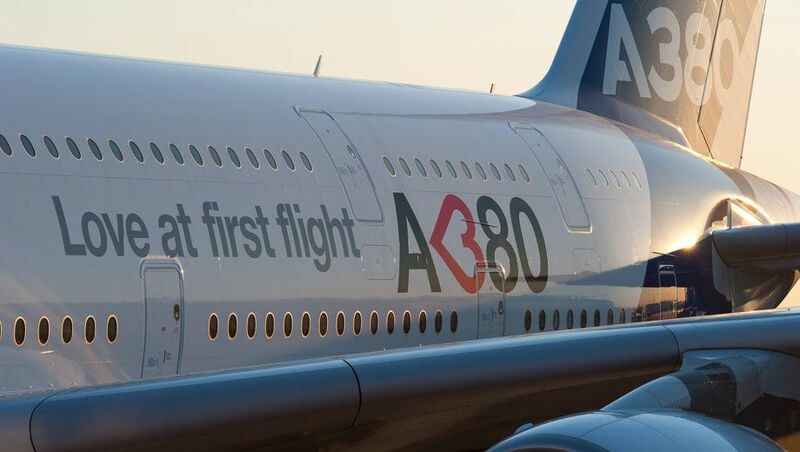 "We have commercial momentum on A380, we will get additional customer" Bregier continued. "We have to get more customers, and convince them there is much more upside than downside to the A380." Earlier this year Airbus admitted it was looking at a next-generation Airbus A380neo, based on lobbying for the proposed aircraft by Emirates Airways, which is its largest A380 customer. The A380neo would rely on new high-efficiency engines (in Airbus parlance, 'neo' stands for 'new engine option') and refined aerodynamics to fly more miles while burning less fuel. “(The A380) is our flagship and there is a distinct possibility that the neo, if built, will give us an improvement in economics of up to 10 to 12 per cent so that is definitely worth having" said Emirates president Tim Clark has previously said. Clark has now dangled the prospect of a massive A380neo order, telling Reuters that Emirates would eventually replace all the 140 A380s it has ordered with an A380neo. Airbus has already added a neo version to the single-aisle A320 family and the popular A330 twin-aisle jet. Airbus is already floating a revamped A380 design with as many as 22% more seats, including an optional 11 seats across in economy, but a supersized A380 could carry close to 1,000 passengers. Known as the A380-900, it's a big brother to the original A380-800 and already exists on the drawing board – but was shelved in May 2010 due to soft demand. However, Airbus has previously said that the "design for the A380-900 can be reactivated at the appropriate time." The A380-900 would carry at least 100 more passengers than current A380-800, with 650 passengers in a standard multi-class configuration and over 900 passengers if filled with with economy-only seating. TheA380-900 is essentially a stretched version of the A380-800, measuring 79.4m from tip to tail – 6.4m (the length of a shipping container) more than today's A380. Artist Clem Tillier's impression of what the A380-900 might look like compared to the current A380-800. Airbus executive vice president Tom Williams says that expanding the already huge A380-800 to even larger variants was the plan from the start. “I lead the team that designed the wings of the A380, and (when she first saw the models) even my good lady wife was quick to point out that the wings are very big in comparison to the fuselage” Williams told Australian Business Traveller in 2011. "And we have airlines today who tell us they love the A380 but it’s too small! 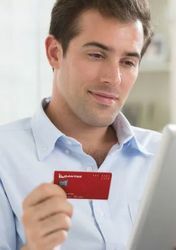 Now it’s not an engineering issue – we can make it bigger – it’s more a question of what would be a good business case and where the market for this is." "My good lady wife"??? What is this, the 60s? wow bring on the bigger bird!
" My good lady wife" Love it. Much like the first time I heard being "gobsmacked" during a trip to the UK. Regional cultural colloquialisms are great. Eminere, you may consider getting out more. In any event, what caught my attention in this article was the statement, "11 abreast T/C seating". So what is the row to row configuration going to be with an odd number of seats, 4-3-4 ? If so did preferred seating just turn into being in the center of the plane. It is quieter in the center don't you know. The configuration would be 3-5-3. Isn't that what's been muted (no pun intended)? More seats does not mean more leg room, Whats the point on having a bigger more earo dynamic airbus when airlines struggle to fill the ones they have. I like the new engines and technology that comes with it but in honesty i could not care if there was 1000 passengers or 5 passengers on a plane, just want the seats a couple of inches more apart. May the odds be in your favor, Airbus A380 and its successor, the Neo aka. the Superjumbo Gigantic White Turtledove. Biggest fuselage at the same overall (2 wings + Fuselage) width of the current, is needed to fit more baggages below and 1K overall seats in 3 class (4-8(4-4)-4 seating configuration). 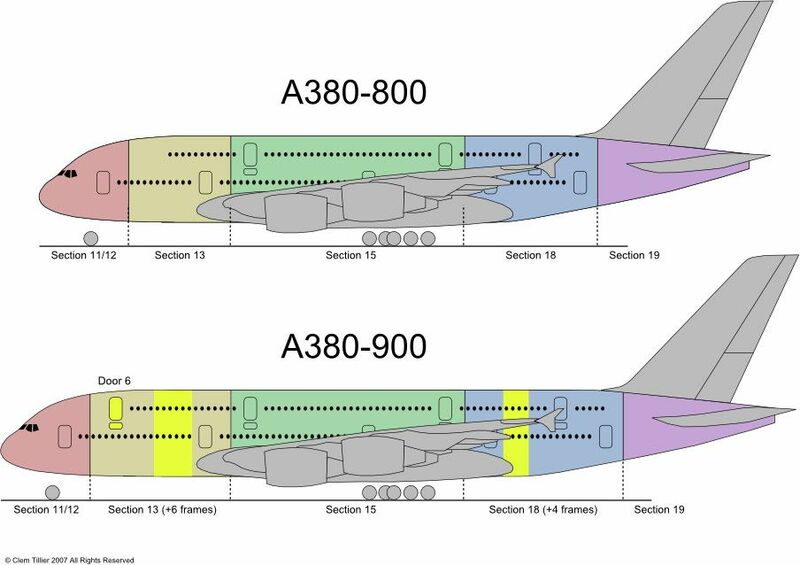 The Original A380 was always designed to be stretched, thats obvious when you look at the A380-800,its kind of dumpy whereas the A380-900 looks the part. Not at all looking like a stretched aircraft. But as always,the business case is to fill this bird with passengers. There lies the rub,in that the great expansion of passengerr numbers has not yet happened. In the early days of the 747,it to struggled to get Airlines to buy,in fact its first few years where decidedly a close call but as passenger numbersa grew so did the aircraft sales. I feel,than if the world had moved on from its greatest recession,then the problem would not exist for Airbus and the A380-800 would already be the A380-900. All I say to Airbus is good luck and kick the doom mongers where it hurts! As Airbus says,"It depends on the market for us to build the A380-900" -trouble is the world is just trying to get over a massive recession; so like the 747 before it, it will have to wait for the market growth. As for the A380-800neo that seems to be a possibility, round about 2019/20 I would think. Its great to have all these wonderful dreams about aircraft size etc but in the end it all comes down to cost. As for Damo comment,I agree. Airbus were the first with the new 18" seat and more leg room-but it is not down to the aircraft manufacturer, its the Airline! So ask next time you fly,who has the best seating arrangements! At the moment I think its Qatar. So the aircraft manufacturer (Airbus) is responsible for developing new engines? And not the engine manufacturer (Rolls-Royce, GE etc)? Surprise they didn't just build the neo on the A380s in the first place. Lots or wasted R&D money. In essence, when doing R&D for new aircrafts, just have them with neo engines. The 'n' in 'neo' stands for NEW. By definition, a 'new' engine type wasn't available 10 years ago when the A380 first flew, let alone years prior when the superjumbo was being designed. That's why they are 'new' engines today - because the technology which makes these new fuel-efficient engines didn't exist back then. imagine A380 without Emirates ordes...will it survive? In short, absolutely not. The Airbus 380 may be axed even with Emirates' interest in the A380neo and A380-900. Production would not cease until existing orders have been delivered (so not for a couple of years at least), however, the reality is that there has been very little interest recently in this aircraft, outside of Emirates. There were zero A380s ordered in 2014... Given so much of its strategy has been put into the A380, one suspects Emirates would be forced to dramatically realign its business model were the A380 program to be axed. It would be a sad day given what a beautiful aircraft it is and how significantly it has enhanced the flying experience. Comment on "Emirates expects Airbus A380neo update mid-year"